On Sunday at Augusta National Tiger Woods completed one of the greatest comeback stories in sporting history. His Masters triumph came 11 years after his last major win, following repeated surgery on a back injury that threatened to end his career, arrest for driving under the influence of prescription medication, a messy divorce and unsavoury revelations about his private life. Here, RTÉ Sport takes a look at ten more incredible spring comeback stories - athletes who have come back from serious set-backs, faced enormous adversity and returned to win on the biggest stage. ‘The Greatest’ arguably missed out on the best years of his career when he was refused a boxing licence in states across America following his 1966 decision to refuse the draft into the US army and fight in the Vietnam war. He was 24 years old at the time and didn’t box at the highest level again until 1971. He lost his big comeback fight against Joe Frazier, but three years later he beat Joe Foreman in the Rumble in the Jungle to claim the world heavyweight title again. The 1981 Grand National winning combination of Bob Champion and Aldaniti both battled back from the brink to win around the famous Aintree course. Champion was diagnosed with cancer in 1979 when just 31 years old while his mount suffered three serious leg injuries that almost ended with the horse being put down. The pair were hugely popular winners in ’81, so much so that they were named Team of the Year at the subsequent BBC Sports Awards. When she was just 13 years old Bethany Hamilton lost her entire left arm in a shark attack whilst surfing. This traumatic, life-changing event didn’t stop her from achieving her dream of becoming a professional surfer however. Despite losing nearly 60% of the blood in her body, she eventually came back using a longer, adapted board. She is a regular on the pro circuit, where she continues to win. Her autobiography also became a bestseller. Before there was Tiger Woods, there was Ben Hogan, one of the greatest golfers of all time. He won nine Majors - six of them after a near-fatal crash when his car hit a Greyhound Bus. He suffered multiple fractures, nearly died due to blood clots and spent almost two months in hospital afterwards. He was 36 years old at the time and 18 months later he won the US Open. The crash left him suffering from fatigue, which meant he had to cut down on the amount of tournaments he played, but he won five of his six starts in 1953, including US Open, British Open and Masters. The Austrian grand prix great won his first Formula 1 world crown in 1975. The following year, while involved in an epic title battle with James Hunt, his Ferrari burst into flames at the German Grand Prix. He suffered horrific burns and nearly died due to smoke inhalation, but just weeks later he was back on the starting grid. He won the world title again in 1977 and added a further win in 1984. Dublin’s Brian Mullins is one of Gaelic football’s great all-time midfielders and he’d won three All-Ireland medals and a pair of All Stars before the car accident in 1980 that looked set to end his career. Three years after that crash he was a central part of the Dubs side that won the Sam Maguire in 1983, though he was sent off in the final victory over Galway. He went on to manage Dublin and Donegal. The Hermanator is one of the greatest Alpine skiers of all time - and he achieved some of his most memorable triumphs after he came close to having his leg amputated. With multiple world cup wins and two Winter Olympic gold medals already in his collection, he was involved in a horrific motorcycle accident in 2001. Doctors considered amputation before opting for massive reconstructive surgery, though it was thought that his racing career was over. He came back though, to win a further overall World Cup title and a World Championship. The well-liked Cork man was a successful jockey before twice nearly losing his leg twice in separate riding accidents and then nearly losing his life during a two-year fight with cancer. He bounced back to win the 1986 Gold Cup on Dawn Run before retiring from riding to become a successful trainer, masterminding famous victories at Cheltenham, including the 2012 Gold Cup with Synchronised and the 2010 Grand National, a race he never finished as a jockey, with Don’t Push it under Tony McCoy. No less a basketball legend than Shaquille O’Neal gave Paul Pierce the nickname The Truth. Calling over a reporter after Pierce shot 42 points as the Boston Celtics beat the LA Lakers in 2001, O’Neil said ‘My name is Shaquille O’Neal and Paul Pierce is the motherf***ing truth. Paul Pierce is The Truth’. O’Neill won an NBA championship with the Celtics in 2008 and was a ten-time All Star. These are mind boggling achievements considering he was stabbed 11 times in the neck, face and back in a nightclub attack in 2000. As well as horrific injuries, he suffered from depression as a result and he has become a powerful advocate and fund-raiser for the hospital he was treated in and depression awareness causes. 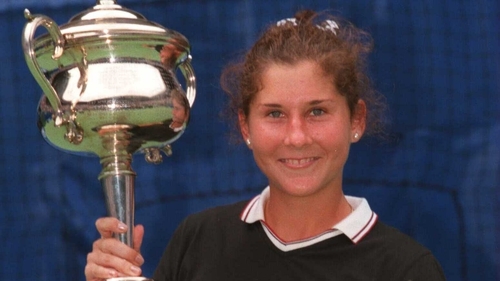 The Yugoslavian-born, US-nationalised tennis sensation was still only a teenager in 1993 and at the very top of her sport when she was stabbed in the back at a tournament in Germany by Günter Parche - a fan of her great rival Steffi Graf. The blade only just missed her spinal cord and she was left with deep psychological scars as well as serious injury. She didn’t play again competitively for two years, but went on to add the 1996 Australian Open to the eight Grand Slams she won before the stabbing.